There is no path at this point, though one is found further down, but it is a simple matter to walk along the shoulder of this ridge, keeping to the right of the ravine. 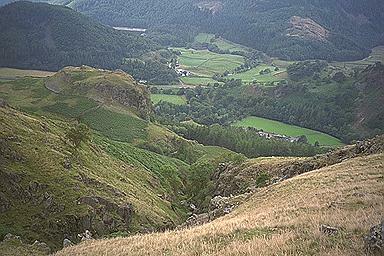 Castle Crag is seen across the ravine, and the wooded Great Howe by Thirlmere in the top left of the picture. Larger version of this picture.